Mystery 45 is a new column in Jigsaw where we talk about 7" singles, new and old. The 7" single or 45, is my preferred format as an artist, listener and DJ. There's no room for filler, you have to stay alert--plus you get all those wacky B Sides where the group uses the under-5-minutes perimeter to "express themselves" beyond the constraints of the pop-song minded A Side, creating totally exciting usage of dialectics. Also, the 7" is the perfect size for artwork, as well as being lower in price than a full album, so it's ideal for us economists. Warning: I fear that 2009 will usher in the era of the $7 7". Can we afford it? Fingers crossed that a single 7" won't increase in cost faster than minimum wage! Being that it's almost November, year end lists are coming together and we are already looking towards 2009. There are a bunch of records that came out in 2008 that we haven't gotten a chance to write about yet, so I'll try to stay on top of it. 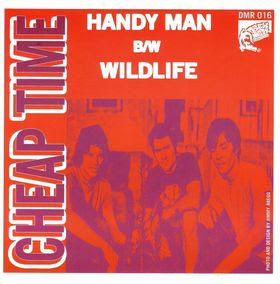 Cheap Time are a stunningly awesome sounding young rock-n-roll group from Nashville, TN. 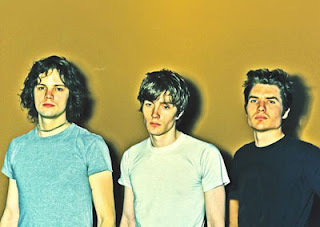 Their song, "People Talk" ,is easily one of the best rock songs of the decade-a total hit- and their righteously snotty mastery of subtle dynamics and minimal aesthetic celebrates constraint by punctuating wild sounding moments with one note guitar solos and staccato yelps. Vocal tones twist as notes squeal up, revealing the underlying emotion lurking beneath the surface. Cheap Time are probably young enough that the first rock they got into could have been White Stripes, but their versions strips out the hard rock zeppelin moments, replacing heavy blues with melodic punk. You don't get the best of the band on this 7", but it's an ok intro to the group if you haven't heard them before. Think early Red Cross, power chords, puberty and you get the picture. "Handy Man" has this Brian Ferry vocal hook thrown onto a Stooges riff that goes up and down the neck. "Wildlife" reminds me of the Dickies or maybe the Didjits, the combination of which brings the Weirdos to mind...what if the Weirdos wrote songs like Wreckless Eric! I hear it playing in the other room! Wow. what else can we unearth about new wave memphis new wave?